My head is in the fireplace. Literally. 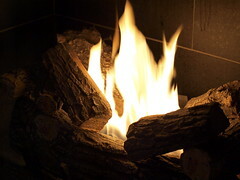 IN the fireplace. And I’m thinking maybe I’m just the teensiest bit out of my element here. Not only is my head in the fireplace, I am swearing under my breath. Furiously. Yes. Much swearing. It was a good idea in theory. Get the Christmas spirit going in our house by wrapping presents in front of the tree, carols playing, a blazing fire. Presents, check. Music, check. Blazing fire? Not so much. I’m mumbling to myself something about electric starters and pilot lights as I walk into the other room to spare my kids the copious cursing. Normally, a fireplace snafu would not send me into a tizzy but today was supposed to set the bar. The bar for future Christmases with my kids as I try to establish some post-divorce normalcy in our holiday routine. I’m worried this year. Worried about fewer presents under the tree. Worried about how my kids will handle this year, with my dad recently deceased and the change in our family situation. I’m doing all the same things—the cookie baking, present wrapping, carol playing. But will it all be enough? Am I enough to bring light and life into the next month and beyond? I shed a few tears and let it out—the fear and worry. Then I wipe my face and square my shoulders, ready to do battle again with the fireplace. I figured out how to hang some pictures last night with only a few extra holes in the wall. I took apart and put back together an entire light fixture this week also—with only one spare screw that I’m still trying to find a home for. Rosie the Riveter I am not—but I’m learning. So hey, the fireplace should be a no-brainer, right? Except pictures and light fixtures can’t explode. Gas fireplaces can. Hmmm . . . I walk down the hallway, feeling like today I’m not quite enough—and then I hear it. My oldest, singing to the strains of Handel’s Messiah in the kitchen. And as I enter the family room, my youngest is dancing to Springsteen’s Merry Christmas Baby. They’ve put the nutcrackers next to the fireplace and Father Christmas in his usual spot. And they’re talking about what we should have for breakfast on Christmas morning. One thing about this blogging business…we soon learn we are not alone. My kids were adults when I divorced, but it wasn’t any easier. But gradually – five years on – it becomes so. Merry Christmas to you and your family! Hang in there Kristine! You are one amazing woman, don’t ever forget it!